Foli fish is a very tasty and healthy fish. But has lots of lots of bones in it. Since childhood, I've never had this fish. I was too much scared of such bony fishes, like foli, bata, charapona. Though I'm a big fan of Hilsa. Somehow I manage to eat hilsa. But this one I've never had in my life. My mom is a great lover of this fish. She can die for this fish. Foli fish 1 500gm fish, cleaned and cut into 2" thick pieces. Take the fish pieces, wash under tap water, remove scales if any left. Now rinse and pat dry them and put on a plate. Marinate the fish pieces with salt and turmeric and keep aside for 10 minutes. Take a pan/earthen utensil, heat the 2 tablespoons mustard oil in it. When the oil is smokey, add the marinated fish pieces and fry till they are nice golden in color. Take them out of the pan and keep into a bowl. In the meantime take a bowl, add turmeric, cumin powder & red chili powder and some water to make a masala paste. Add rest of oil in the same oil, or you may discard the fried oil. Now temper the oil with kalonji and silted green chilies. Fry for a while and add the masala paste, little salt and keep stirring for some time. When the oil will start separating add the fried fish into the pan and keep stirring them too, but slowly. Otherwise, fishes can be broken. Now add 1 cup of warm water to the pan, and cover the pan to cook nicely for 2 minutes on simmer. After 2 minutes open the pan and higher the gas. Boil the gravy for another 2 minutes and turn off the heat. Pour the curry into a bowl and garnish with slitted green chilies. If you wish, you can add potatoes, cut into lengthwise. 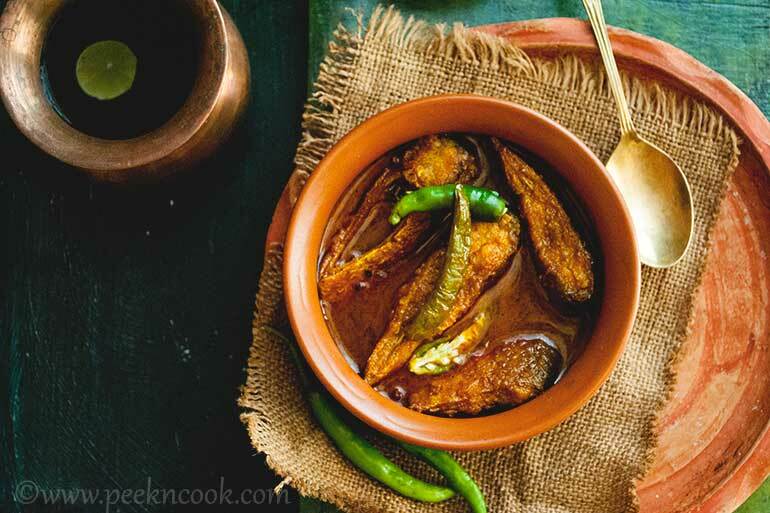 Fry them after frying the fish pieces, and add them into the gravy and boil till the potatoes are tender and soft.